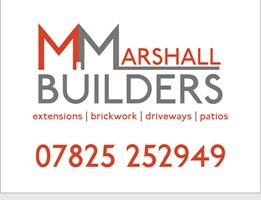 M Marshall Builders - Builder based in Peacehaven, East Sussex. Hi, my name is Matt. I have been in the building trade for 15 years. I'm a bricklayer but do a lot of extensions, driveways, patios, and digger diving. I was brought up in the building trade as it was a family business. We specialised in new builds for 10 years as a family business. Then my Dad decided to retire. So, I decided to go out on my own with my own business. Been doing that for the last five years.